Boost your wireless network signal strength or signal penetration with a high-power Wireless Network Booster Amplifier. 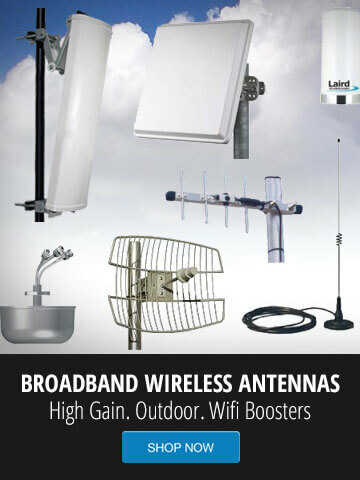 GNS Wireless stocks both indoor and outdoor amplifiers from 900 MHz to 5.8 GHz. Whether you place a WiFi amplifier indoors or outdoors, you will increase the receive sensitivity of your wireless clients, as well as increase your signal strength in the surrounding area. Most of the WiFi amplifiers you will see below use AGC technology. AGC allows an amplifier to be effectively Plug-and-Play by sensing the radio frequency (RF) input signal power and matching the power output level to it. This includes all bi-directional amplifiers in 900 MHz, 2.4GHz, and 5.8GHz frequency range. If you are unsure whether or not the wireless radio you are using will be compatible with a high power amplifier, please contact GNS Wireless directly at (516) 214-0321. We will be happy to assist in selecting the correct wireless network booster and amplifier.